I have my own criteria for choosing watermelon, but this season I thought I'd consult a watermelon grower to see how my criteria stack up against an expert opinion. After talking to Sarah Nolan, CSA Coordinator of South Central Farmers' Cooperative, I've realized that I'm pretty much on target, with a few notable exceptions. 1. Don't buy a watermelon before summer is in full swing. Sarah recommends buying watermelon that was harvested "during summer's peak," because watermelons need heat and sun to grow well. "Peak" of course will vary from region to region. July 1 is my personal choice, mostly because I love having watermelon for Fourth of July even if it's not yet at the summit of perfection. 2. Buy watermelons that are as locally grown as possible. It's good to buy locally-grown produce for a variety of reasons. I think it's especially important for watermelon because buying locally increases the chances of getting an adequately vine-ripened melon. 4. Buy a large watermelon. Sarah suggests that bigger watermelons are not necessarily better and that "a good watermelon depends on variety, location it was grown, and time spent on the vine." But because watermelon is usually sold by the pound, I prefer a high flesh-to-rind ratio to make sure I get my money's worth. 5. Buy a melon that's heavy for its size. I like a melon that's sweet and juicy, so the heavier it is, the more likely it is to have a high water content. 6. Look for a "field spot." Watermelon often has a white or yellow patch on the bottom side called a field spot. It's a sign that the watermelon has been allowed to ripen on the vine. Sarah says it's not necessary for a melon to have a field spot to be good, but it's worth looking for. 7. Thump the watermelon and listen for a deep echoing sound. According to Sarah, you want a watermelon that "sounds like a drum when you pat it with your hand. If it has a dull thud, that means it will likely be mealy and either too ripe or harvested too early." 8. Never buy a cut watermelon. Before I became a Master Food Preserver, I was somewhat more relaxed on this point. Now I steadfastly refuse to purchase a cut watermelon. 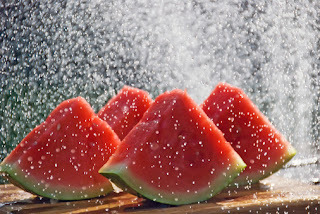 If you don't wash the watermelon before you cut it, any bacteria that existed on the outside of the melon will be transferred to the flesh on the interior. Unless you were present when the melon was cut, you cannot know if proper food safety guidelines were followed. The melon also will go bad more quickly after it's cut. Unless you're having a large party, it's difficult to eat a watermelon in one sitting. I never refrigerate a watermelon before I cut it, but once it's cut I'll chop the amount I think I can eat within the next 24 hours into wedges and store them in a glass container in the refrigerator. I'll leave the rest of the melon uncut and cover the exposed flesh with aluminum foil before putting it in the fridge. I eat watermelon at every meal until it is gone. There's always risk associated with choosing the perfect watermelon. In spite of careful selection, sometimes you'll get a lousy watermelon. Remember that an occasional failure is part of the adventure - and the pleasure - of eating watermelon. Make this salad just before you're ready to serve it because the liquid from the watermelon will turn the goat cheese into a slimy mess if it sits around too long. You'll see that the ingredient quantities are small because I don't like to have leftovers, but the recipe doubles and triples well. 1. Place watermelon cubes into a medium sized bowl. 2. Add apple cider vinegar and mint chiffonade and stir gently to combine. 3. Top with crumbled goat cheese and a few whole mint leaves for garnish. Note: Unless it's a really hot summer day, I like this salad best when the watermelon is at room temperature. I make my own goat cheese, which is remarkably simple to do, but if you buy goat cheese make sure it is as fresh as possible and does not contain any additional herbs or spices besides salt. I infuse my apple cider vinegar with blackberries, but plain apple cider vinegar is just fine. You can also substitute freshly squeezed lemon or lime juice for the apple cider vinegar, but I rarely find good citrus when watermelons are at their best so I don't often make that substitution. I do, however, make my own blackberry-infused vinegar.